I’m perfect! I stink! 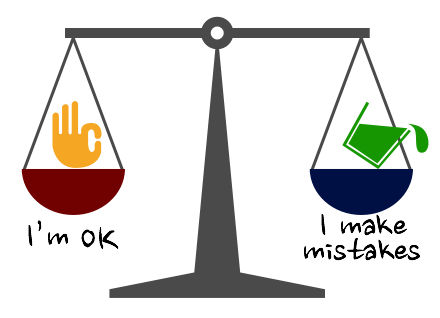 The First Balance Challenge. Do you know anyone who thinks that he’s right all the time, like he’s incapable of making a mistake? And do you know anyone who is so hard on herself that she thinks she can’t do anything right? If you want to make good decisions that are going to satisfy yourself and people around you, you have to be push yourself to acknowledge when you make mistakes… but not push so hard that all you see is your flaws. It’s tough. In order to problem-solve social situations well, you need the right dose of harsh honesty and self-confidence. 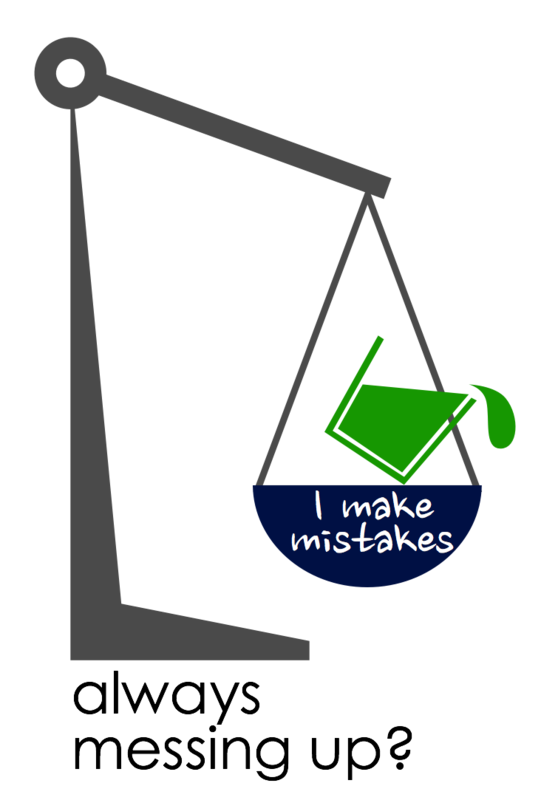 That’s right: it’s a balance—between I’m OK and I make mistakes. It’s good to be confident, to have a positive image of yourself. It helps you take on challenges and be outgoing. But if that feeling of “I’m OK” gets pushed too far, then you end up thinking you’re perfect, that there’s no room for change or growth. People who take I’m OK to the extreme think something like, “I’m fine, everyone else is crazy, I don’t need guidance or advice from anyone.” Whenever a problem arises, they blame the other person in all circumstances—even when they may have been part of the problem. If a guy named Manny is working with his classmates on a science project, and he insists that everyone use his idea and that he does the writing on the poster and he do the calculations—his classmates will likely be annoyed. And if Manny leaves the situation thinking he’s done everything right and the others were mistaken, he won’t think to make any changes to his behavior. So he’s not likely to have much success in future interactions. Getting stuck only thinking I’m OK prevents you from honestly evaluating interactions so you can make decisions that you and the others around you will be happy with. To ensure you don’t get stuck in that I’m OK trap, it’s important to acknowledge when you mess up. You need to own up to your missteps, take responsibility for your mistakes. But what happens if you hyperfocus on your own mistakes? If you get stuck on I make mistakes, all you do is focus on your errors. You may “beat yourself up” and feel like a horrible person, like can’t do anything right, or are incapable of making a correct decision. This can lead to low self-image and even depression. And if that happens, you may shy away from working with and hanging out with other people. So, you probably guessed where that was heading: we need to strike a balance between thinking I’m OK and I make mistakes. I’m OK… but not perfect! I make mistakes… but not all the time! I’m a generally good person… but I may mess up and bother others. I have things about me I can improve… but that doesn’t mean I’m no good! This kind of honesty with yourself is something that can be extremely difficult for most people. Autistic folk might struggle more with evaluating the perspectives of other people in the moment to appraise an interaction. But neurotypical people are no experts in this balance! I’ve personally worked and gone to school and socialized with enough NTs who think they are incapable of error. Everyone can benefit from honestly considering this balance for themselves. Are you usually hard on yourself, thinking you’re always messing up? Remember you’re OK.
Do you think you are perfect and everyone else around you is to blame? Remind yourself that you can and do make mistakes. I’m good enough, I’m smart enough… and I sometimes mess up. And that’s OK.